A dream for the dreamer and esteem for those who put in all efforts to realize their dreams! Wendy picked up her 4th major under Mr. Robert Caviness at the Valencia Valley Kennel Club of New Mexico and Simon picked up his lst major under Mr. Robert Caviness. 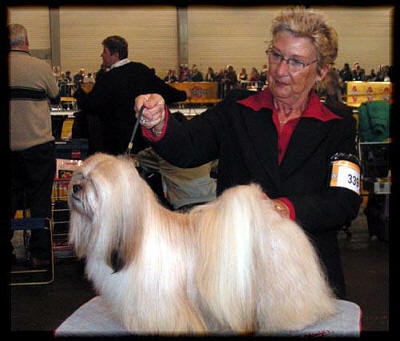 Fran's team started on packing for the National Lhasa Apso Specialty in Saint Louis, Missouri USA. Kaden will be flying in from Florida. Thank you Fran for the news and good luck for your team at the National Specialty! Brno Checz Rep. Dogshow Le Sajnim Indian Dream won CAC/CACIB award with Best of Breed, this time under judge Mrs. RN Dr. J.Ovesna congratulations and thank you Eliska! USA , Texas Lubbock Kennel Club Le Sajnim Arianna won six more points for her American Championship with Best of Breed over specials under judge Mrs Elaine ridgen , Arianna is owned by Mrs Susan Pope and Le Sajnim Arianna is handeld by Mr CL Eudy. Congratulations Susan and Arianna! 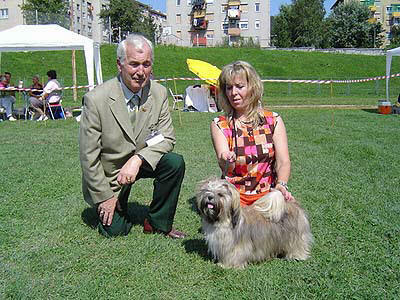 Lazany Slowakia, Slovak Lhasa Apso club Specialty show Le Sajnim Indian Dream won again CAC award, this time under judge Mrs. Z. Jilkova congratulations and thank you Eliska! USA , Sangre de Cristo Kennel Club in Santa Fe, New Mexico Le Sajnim Arianna won her first points for her American Championship under judge Mrs Elaine Young, Arianna is owned by Mrs Susan Pope and Le Sajnim Arianna is handeld by Mr CL Eudy. Congratulations Susan and Arianna! Luxembourg ;EL Minja's Adasha, after winning her German Juniorchampion title and Landessieger title she obtain her Luxembourg junior championship last weekend in Luxembourg capital, we congratulate Karin with her succesful starting career , thank you for showing and taking care for Adasha , owned by Mrs Karin Hertz, in Germany. Slovenia, Trbovlje, EL Minja's Sweet Sensation obtain her Junior Winner title under judge Mr E.Deutcher, congratulations for Mojca Bregar for taken care and handling sweety to her titles! Congratulations too Mojca and Sweety. Hong Kong kennelclub CH EL Minja's Nag-Po-Chen-Po HK.Ned.Bel. Int. Lux. CH. Benelux winner 2000 won BOB under judge Mrs L Harwood from Australia. CH EL Minja's Nag-Po-Chen-Po HK.Ned.Bel. Int. Lux. CH. 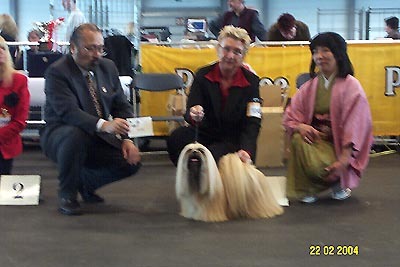 Benelux winner 2000 also won the Asia Kennel Union Dog Show, with the BOB under judge Mr. N Nakamura from Japan, congratulations to Andrew and his excellent handling and grooming team Rex and Jacky. 25 july; Marktheidenfeld,Germany; EL Minja's Adasha from Karin Hertz won the 1ste. and Jdg.CAC under judge Mr.J.Weinberg, congratulation Karin!! 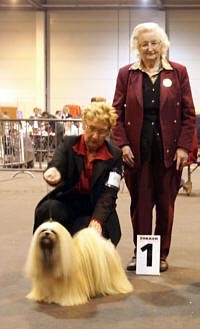 10/11 july 2004; Int.Dogshow La Louviere in Belgium; BIS,BISS,Multi Champion EL Minja's Thsang-Pa won Best of Breed and his daughter EL Minja's Thamina won Best Puppy and 3rd Best puppy in Show this under judge mr F.DeClerqck and Mr J.Schepers. CH.Le Sajnim AL-Marah "NEW CHAMPION" in the USA, Colorado, at the Great Fork Roaring Kennel Club show Le Sajnim AL-Marah won 2 Majors on saterday and sunday over a big entry under breed specialist judge Mrs. Jean Lead and Judge Mr. Joe C Walton Le Sajnim AL-Marah his agent is CL Eudy and is owned by Mrs Susan Pope. Our complements and congratulations for CL and Susan, thanks a lot for CH.Le Sajnim AL-Marah American Champion Title! 25/26/27 june 2004 news from EL Minja's Machu Pichu of Switserland he is a son of BIS,BISS,Multi Champion EL Minja's Thsang-Pa and brother of EL Minja's Sweet sensation watch the news BELOW of EL Minja's Machu Pichu and his sister news, BIS,BISS,Multi Champion EL Minja's Thsang-Pa won 27 of june Best of Breed at the Int. 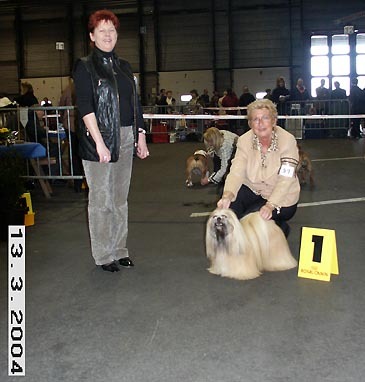 dogshow Genk under judge Mr Norman Deschuymere. 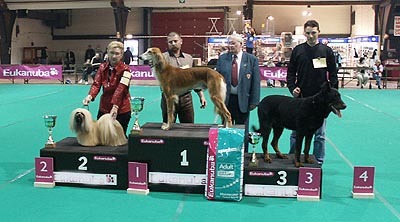 26.june at Krakow in Poland CH.EL Minja's May Boy obtain again CAC/CACIB and BOB this time under Judge Mr.Matyas. USA: “Jackson" son of CH EL Minja's Walk on Water * CH EL Minja's Amethist, finished his American Championship Just like "kaden" and "Daisy" did recently from Fran Strayer. Le Sajnim AL-Marah obtain last weekend all his points under judges Mr. Don Rogers, Mr. William Cunningham and judge Mrs. Lois Wolf-White and just need one major to finish his American Championship! 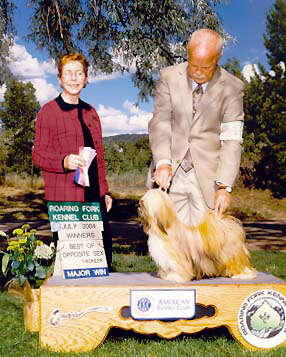 Colorado , USA , Mrs Fran Strayers and Bev Adams Lhasa Apso's Wendy and Wicket won there majors at the Fort Collins Show under Mr. R. Caveniss Wendy was WB & BOW for a 3 point Major on the same day Wicket was WD for his 3 point major. At the Greeley Kennel Club under Mrs. Eva Berg Wendy was WB, BOW & BOS for her 2nd 3 point major and Wicket was WD for his 2nd 3 major pointer. EL Minja's Adasha, won her German Juniorchampion title and Landessieger title last weekend in Prinzhagen, J.CH EL Minja's Adasha is owned by Mrs Karin Hertz. Mrs Sandy Zade was busy up in the Washington Area with a 4 point major on Mikey, under judge Carolyn Herbel. 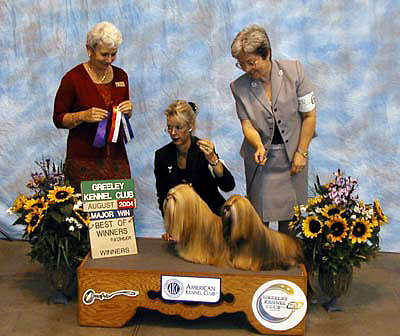 29-30-31 may 2004; Colorado, USA bred by EL Minja's Lhasa Apso Champions!! NuSeng Who's U R Daddy aka - Kaden finished his American championship with 2 - 4 point majors. NuSeng's Miss Walking Miss Daisey aka Daisy picked up a 4 point major also on Sunday under Barbara Ann Langlois with a WB and BOW bred by CH EL Minja's Walk on Water * CH EL Minja's Wind in the Willow, these two Lhasa Apso's are bred and owned by Mrs Fran Strayer Congratulations Fran!! CH EL Minja's Walk on Water * CH EL Minja's Wind in the Willow, these two Lhasa Apso's are bred and owned by Mrs Fran Strayer Congratulations Fran!! 24 may 2004, Le Sainim AL-Marah wins in the USA, in the Rio Grand Kennel Club on Saturday & Sunday, May 22 & 23 CL Eudy showed Marah under Judge Mrs. Karen MCFararwlen AL Marah won Best of winners On Sunday he showed under Dr. Wanda V. Spediacci, Marah won Best of Breed and Best Puppy in Show! AL-Marah is handeld by prof. Handler CL Eudy Marah is owned by Mrs Susan Pope. Thanks Susan. 15 may 2004, Euskirchen,Germany; EL Minja's Adasha won 1st.and Junior CAC in the junior classes, under judge Mrs C Klotz from Germany. Adasha is bred by CH EL Minja's Gambler * CH EL Minja's Good as Gold, and is owned by Mrs karin Herz congratulations Karin. BIS,BISS,Multi Champion EL Minja's Thsang-Pa won his Champion certificate and Best male and again Best of Breed , Thsang-Pa Also won Best in Group and finished 2e Best in Show!!! 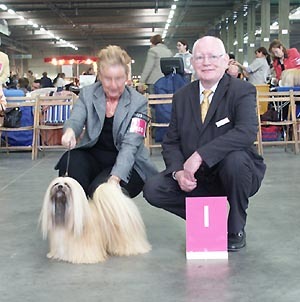 This under the judges Mrs C Delmar from Ireland and judge Mr L. Lauwers from Belgium. Multi CH.EL Minja's Good as Gold won also her Champion certificate and best female and obtain her newest Title of Belgium Champion under judge Mrs C Delmar. Do we have to say more, the essence of Lhasa Apso breeding. 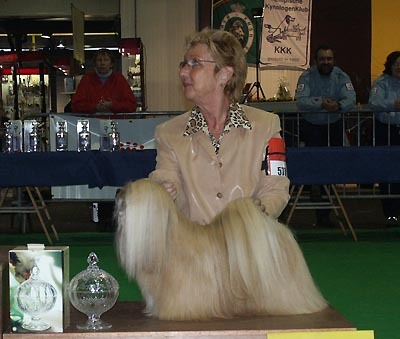 9 may 2004; EL Minja's Sweet Sensation owned by Mrs Mojca bregar won best puppy in Budapest Hungary Tibetan specialty show judge was Mr Primoz Peer breed specialist congratulations Mojca! 9-10 may 2004;Le Sajnim AL-Marah won again his points in Texas on saterday and sunday , handeld by prof. Handler CL Eudy Marah is owned by Mrs Susan Pope. Thanks Susan. 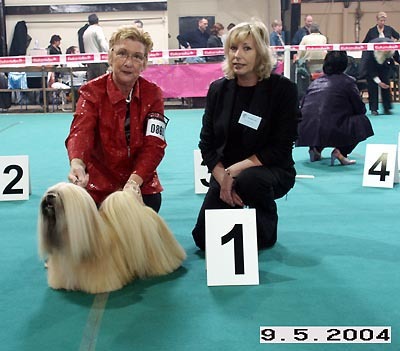 BIS,BISS,Multi Champion EL Minja's Thsang-Pa won 2e , his kennelmate Kirashu Khadira won best Lhasa Apso female with CAC/CACIB this under judge Mrs J.Toebak. BIS,BISS,Multi Champion EL Minja's Thsang-Pa won best Lhasa Apso male with CAC/CACIB and won Best of Breed, his kennelmate Kirashu Khadira won best Lhasa Apso female with CAC/CACIB this all under judge Mr Oates from Ireland, thank you Mr Oates, BIS,BISS,Multi Champion EL Minja's Thsang-Pa obtain res Best In Group under judge Mrs Monique Van Brempt. 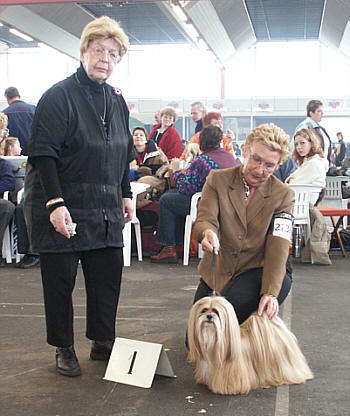 EL Minja's Adasha won Very Promising in the Lhasa Apso puppy classes, and in the ring of Honor Adasha obtain res.Best Puppy In Show Adasha is bred by CH EL Minja's Gambler * CH EL Minja's Good as Gold, is owned by Mrs karin Herz and our Kirashu Khadira won her first Luxembourg CAC. 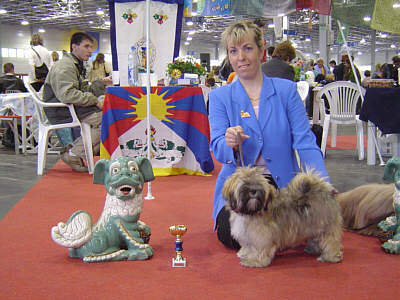 BIS,BISS,Multi Champion EL Minja's Thsang-Pa won best Lhasa Apso male with CAC/CACIB and won Best of Breed,under judge Mrs Steffi Kirschbilcher. BIS,BISS,Multi Champion EL Minja's Thsang-Pa won best Lhasa Apso male with CAC/CACIB and won Best of Breed, his kennelmate Le Sajnim Indian Dream won reserve Best Lhasa Apso male ResCAC/ResCACIB and our Kirashu Khadira won best Lhasa Apso female with CAC/CACIB this all under judge Mrs Lotte Jorgensen from Denmark, thank you Mr Jorgensen, BIS,BISS,Multi Champion EL Minja's Thsang-Pa obtain a Group 3th placement under judge Mrs Maria de Wilde-Voet. 14 march Dog of the year show in The Flint at Amersfoort organised by the Royal kennelclub Cynophilia only for Groupwinners and placements all breed. and 2 Lhasa Apso's are from our Homebred EL Minja's Lhasa Apso kennel !! both had won the highest scores in the groupwins over last year 2003 and the most placements. We thank our friends and fans for their support at the shows, and a special thanks to all the judges which are thinking so highly about our Lhasa Apso's. Multi CH.EL Minja's Good as Gold won CAC CACIB best Lhasa Apso female and Best of Breed under judge Mrs A Kolbe at the great Zuidlaren Int. Dogshow in the Netherlands. In the Group judging she obtain a Group 4th placement,just like the show in 2003! Le Sajnim AL Marah won his first bleu ribbon at Faith City Kennel Club on the 28th of Feb. under Mrs. Doris Cozart in Oklahoma ,USA he won best Best Lhasa Apso puppy. Marah is owned by Mrs Susan Pope. 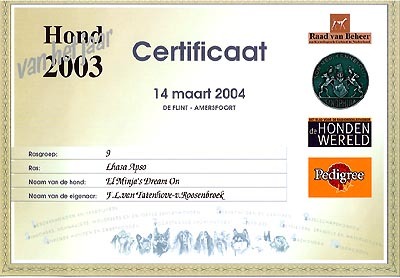 22 februari 2004; 40th Flanders Dog Show in coöperation with the Japan kennel Club, BIS,BISS,Multi Champion EL Minja's Thsang-Pa won best Lhasa Apso male with CAC/CACIB and won Best of Breed, his kennelmate Le Sajnim Indian Dream won reserve Best Lhasa Apso male ResCAC/ResCACIB under judge Mr Kamisato Hiroshi from Japan, thank you Mr Kamisato. Le Sajnim Indian Dream, foto by Eve from Belgium,thanks Eve! 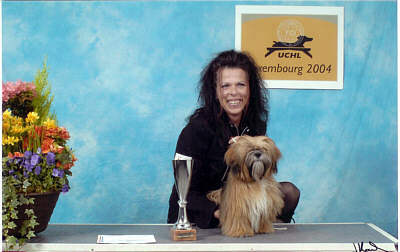 14-16 februari 2004; Denver Colorado, USA bred by EL Minja's Lhasa Apso Champions!! Best In Show Bred By "Kaden"
Our sincere appreciation and thanks goes to all the judges who think so highly of our Lhasa Apso's.